Last edited by bibbster; 06-27-2013, 06:44 AM. Thanks for the news Jeremy. This track is full of short, tight, curves. Cars that have been tuned accidentally or otherwise, for running on courses like this really shine here...and they were all a hoot to qualify. Every single car handled really well, and with just a hair over a second separating the top and bottom...I can't wait to race them for 2 minutes each! 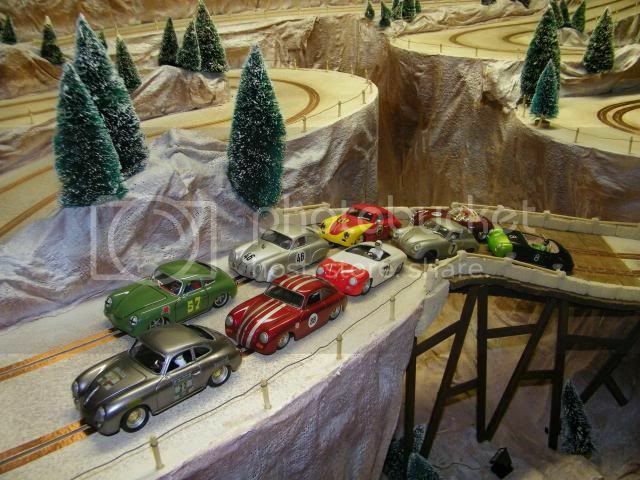 Nice track, looks like fun. Wow, that track does look awesome and I can't believe my car Q'd at the sharp end of the field. Race day will certainly be different but I'll take that for now. Thanks guys, this little track really is a hoot. 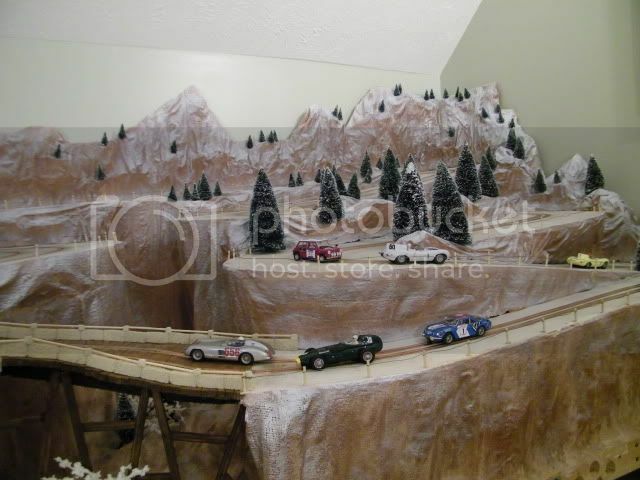 Everyone that has ran cars on it has been surprised at how much fun a track on a 4x8 sheet can be. It's a great track to practice your trigger control to say the least. I must say, the coverage is excellent on B-TV. Thank you sir! Quite welcome...wasn't sure this ole laptop would handle the live feed. Fortunately the driver of the Porsche was found alive and well walking around in a daze at the bottom of the canyon. Well, I told you the racing was gonna be close...there were 2 cars that completed 16 laps in the 2 minute race, 6 that completed 15 laps, and 1 that completed 14 laps. In order to be able to see who traveled the furthest past the finish line prior to time running out, I took a picture of each cars placement on the track when the time ran out. That made it really easy to determine the winners. All these cars were really great to run. Each one was a little different but they all ran smoothly. Thanks so much for the opportunity to let me play with your toy cars. What a blast! Now, who doesn't want their car back? Thanks for the run and congrats to the top Oregonians. I'd like my car back please. Thanks Jeremy, that was the first time I got to watch a proxy round online and it was entertaining. I am shocked my tub went that fast as I literally built it from parts I had lying around, your track must have loved it so much. Thanks for the fun round and online coverage. Looking forward to getting it back to see what I can do with it for TLOR. Congrats to the other podiumites as well! PS - Do you need addresses for shipment? I will PM you mine. Glad you enjoyed the live streaming of the race. I did it for the midget proxy and it went over just as well. Simple to do and fun to boot! Pieced together or not, that little tub was a treat to drive. I don't know what you did, or didn't do, but keep in doing it. I think I have everyone's address, but shoot them to me just in case.